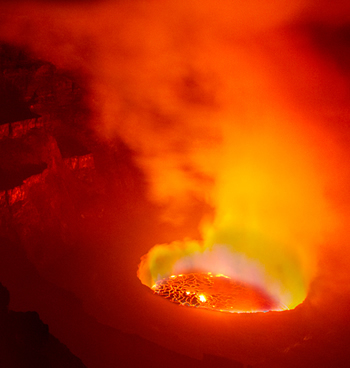 to explore Mount Nyiragongo, an active volcano containing a lava lake located in virunga national park eastern DRC. Rising at an altitude of 3470 meters, hiking does not require a little bit of fitness. 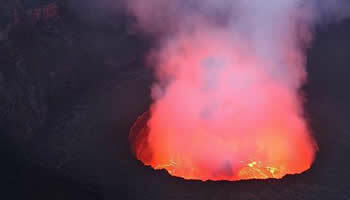 This 3 days safari gives you an opportunity to witness the active lava with smoke and fire. Nyiragongo last eruptions occurred in 1997 and 2002. Though there is active lava activity going on it is safe to hike the volcano and sleep on top because many tourists have done so. Start your trip in Kigali then drive to Gisenyi for a night, a boat cruise on Lake Kivu is recommended. The second day cross the border to Congo hike and sleep on the summit then descend to transfer back to Kigali on the 3rd day. Wake up early to capture the sunrise. After breakfast you will descend back to kibati station and your guide will welcome you and drive back to Kigali.